This event, for ladies, attracted a small but elegant entry of 4 pairs. This didn’t result in any lack of tennis for the participants, who each played 3 matches, 1 set to 8, one after the other on Sunday morning. 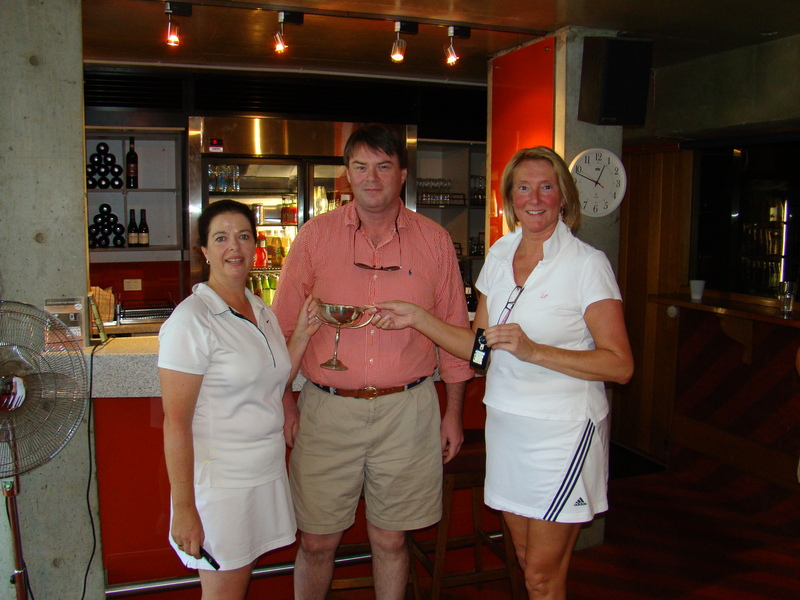 The winners, unbeaten, were Julia Page & Brigitte Claney; the runners-up Michelle O’Rorke & Kim Dudson. Julia & Brigitte combined effectively; Julia’s sedulous play from the back of the court allowed Brigitte to express herself fully on the volley nearer the net. They thoroughly deserved their win. Paul Andrews & Sophie Johnson, tournament organisers, controlled things immaculately and prepared a splendid lunch for players and hangers-on. 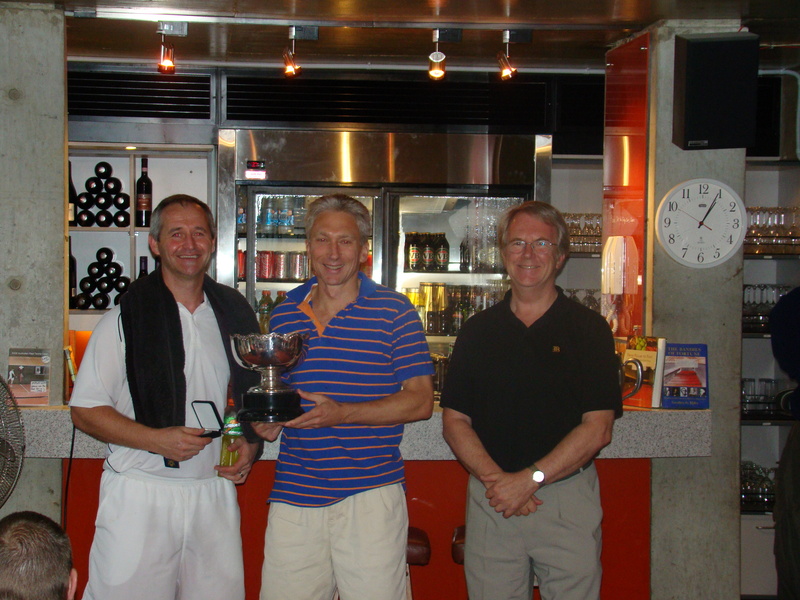 This was much enjoyed and appreciated by all, accompanied as it was by two bottles of sparkling wine, donated by David Hayne in memory of his mother, after whom the tournament is named. Please find below the Expressions of Interest information and entry form for the Boomerang Cup 2011. Expressions of interest from potential teams must be sent to the RMTC before 30 June 2010. All the matches are played as best of 3 sets and everyone managed to bring their best game with them. With the Hobart lads in town it meant that, Melbourne freak storms notwithstanding, the evenings became party time. With the Saturday BBQ abandoned due to bad weather we were entertained by Lebanese food and Belly Dancers at Kanzaman. During the evening Merel Hince showed the belly dancer a move or two and Dan Williams claimed it was his birthday (it wasn’t, but it worked). As always it was great to see the Hobart contingent in the club and everyone who joined in had a great time. Thankyou for being here Hobart. And finally, thankyou to everyone who dropped in to show their support over the long weekend. 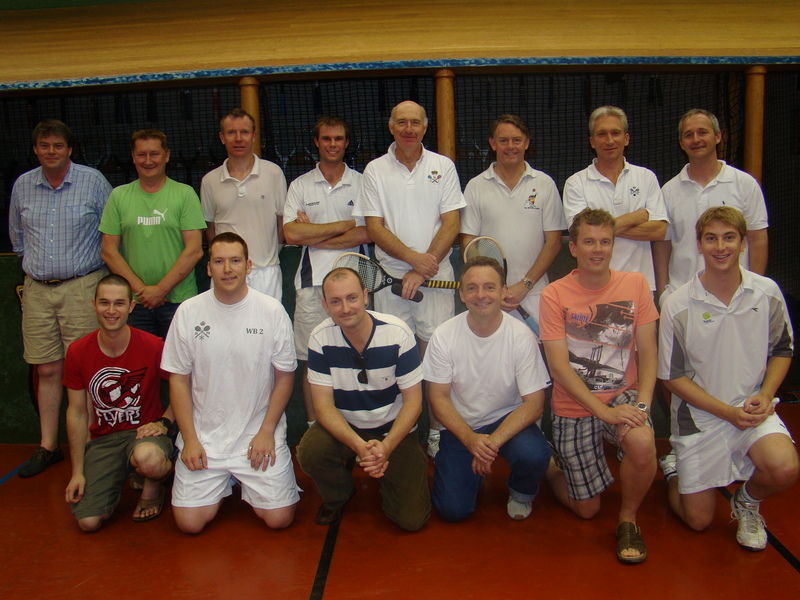 Fifteen pairs entered this event, in two grades, at the week-end, with all three Australian clubs well represented. Mike Happell & Bret Richardson retained their title with a dominant performance at the RMTC on Labour Day; they beat their familiar rivals and 2007-2008 champions Julian Snow & Chris Sievers. The score was 5/6, 6/4, 6/4, 6/2. Bret seems to have made a full recovery from the back injury that hampered him for the second half of 2009, and was as deadly as ever at close range on the volley. Meanwhile, his evergreen partner displayed immaculate control of the ball onto and around the tambour. As hard as they worked, the losers were increasingly unable to make any inroads into the winners’ armoury. Bret & Mike will surely be very difficult to beat in the Bathurst Cup in New York next month. In the A Division event, the final was a match up between two pairs from opposite ends of the experience spectrum, neither of whom had been seeded. 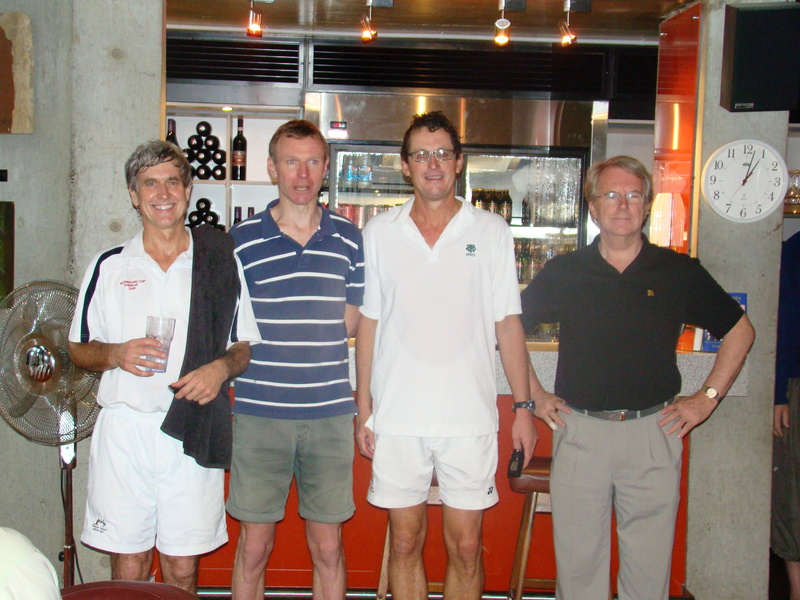 On the one hand were Wayne Spring & David Parker, representing Ballarat, and integral members of our 50s team in the Ted Cockram Trophy in London next month. On the other side, the 22yo Welch twins, previously from Hobart now at Uni in Melbourne. The youngsters had had a fine tournament already, winning three matches against the head, and indeed recovered well to win the first set of the final from 5-1 down. Thereafter, experience told, and Wayne & David combined increasingly well to gradually gain the ascendancy and come home easy winners in the last two sets 6/1, 6/2.